At Coyne Bros Funeral Directors in Formby, we are dedicated to being there for you in your time of need. We are funeral professionals, and we are here to organise a respectful, compassionate and unique funeral service for your loved one, which creates a lasting memory for all those who attend. You can tailor every aspect of the day, from the floral tributes to the hearse, to the type of music that is played during the service. We have been helping the families of Liverpool and Formby since 1948, when our founders started a taxi service. The brothers regularly took families to and from funerals, so they decided to venture into the funeral industry and buy their own hearse. They went on to open three funeral directors. The other funeral homes are on Lower House Lane in Croxteth and on Bridge Road in Litherland. Family members of the founding brothers still work in our funeral homes today. They are here to provide you with an unparalleled standard of funeral care, just as the Coyne brothers would have done. 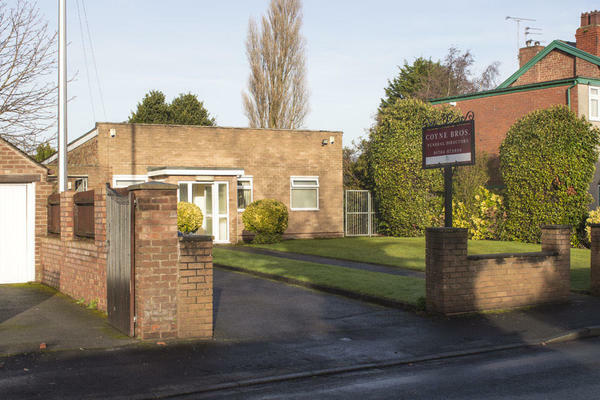 From our purpose built funeral home on Old Mill Lane, Coyne Bros serves the local communities of Little Altcar, Hightown, Ince Blundell, Great Altcar, Down Holland Cross and the south of Southport. Our funeral home was designed with you in mind; we have three private resting rooms, where you and your family can spend time with your loved one before the funeral. Because of our location, we are central to a number of churches. The Formby URC Church, St Peter’s Church, Holy Trinity Formby and the Roman Catholic Church of Our Lady of Compassion are all less than a mile away. You can call us at any time, our lines are open 24 hours a day, seven days a week. Call us as soon as you need us. Call us today on 01704 873899 to talk through your personal requirements. We are located at the end of Old Mill Lane, two minutes from the centre of the village. Our staff are available 24 hours a day on 01704 873899 if you require our services outside of these hours.